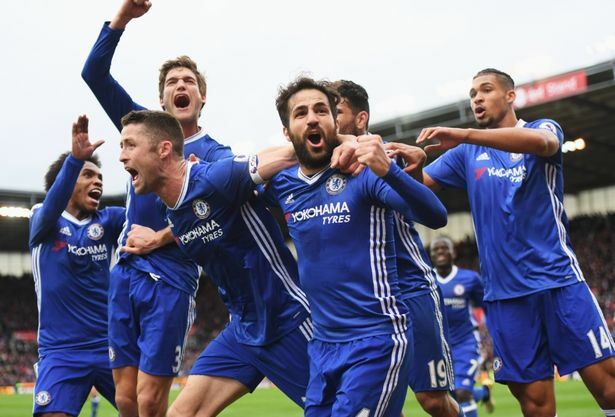 Chelsea's celebrations at the final whistle against Stoke on Saturday gave an indication of just how big those three points could be. Alan Shearer and Rio Ferdinand believe that no one can catch Chelsea now. Stoke away is always a potential banana skin with our hosts being much stronger at the bet365 than they are on their travels and for many this game would have had this marked as a possible draw or even a Chelsea defeat as part of their Accumulator betting tips. Having already achieved some notable results, you would have imagined that our title rivals watched, waiting with anticipation for us to lose points to gain some sort of advantage - It never happened as Chelsea came through the game with a late Gary Cahill winner to extend our lead on Saturday night to thirteen points (cut back to ten after Spurs won yesterday). For the second game running, Antonio Conte's side came up against a team that chose to try and stop Chelsea playing by focusing on individuals in the side rather than play the game to their own strengths and for the second game running, the Chelsea players rode out the storm, maintained their focus (despite one or two slips) and focused on the football which is great credit to the Manager. Antonio Conte's celebrations are there for all to see. His reactions to every single player and to the supporters as he walked of the pitch; encouraging each and every single one to sing louder, celebrate bigger was a signal that he too believed these three points to be massive in the title race. "My players are understanding my idea of football. They are going to adapt in my system. In my philosophy of football. It is true that I think we are building something important." - Source: Daily Mail. Two of the most influential pundits in our game also believed the importance of the victory for Conte's side post-match. Both Alan Shearer and Rio Ferdinand (on different channels) heaped praise on Chelsea and both believe that they will not be caught in the title race now. "They didn’t play that well today, it was a bit of a scrappy game, loads of fouls, no Hazard but they showed great experience in how to see a game out. They showed a great will to win and a will to be champions. They dug it out in the end. It was such a big win, it was such an important one. I think that the players think now how that how huge that was today. "These boys are running away with it. There’s no one consistent enough to stay with them in the league. They’ve found a way of playing, a formula, an understanding of the manager’s ideas. I think he [Conte] has to take huge credit, the season before… terrible season, so far off the pace. He’s come in and, based on repetition, built an understanding of how he wants the team to play and the players are really putting it in, he’s run away with the league this year." With Tottenham ten points behind us and now our closest rivals, Chelsea's next two games are at home against Crystal Palace and then Manchester City. If we can take at least four points from these two games that would be a great return. If we can win both games that would be fantastic with Manchester United and Everton of our remaining games being the most difficult on paper. We also have a chance for revenge with Tottenham at Wembley in the FA Cup semi-final on the 22nd April. If we can beat Tottenham on that day, we could put a massive dent in their confidence which could play a part in the run in to the title also. As we take to the pitch on that day, we would only have six games left to play having played City and United and I hope that we have managed to maintain our lead over the side from North London. 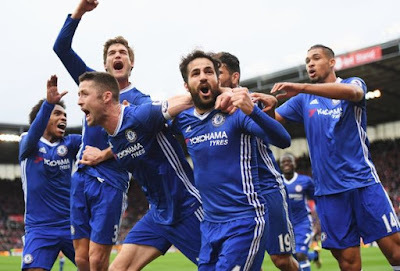 One thing is clear as we head into the international break, Chelsea are on a roll having won their 20th game from the last 23 in all competitions and confidence is high. This victory over Stoke once again demonstrated the fact that this team under Antonio Conte are happy to mix things up, alter their tactical approach within games to go for the win and can dig out results at any time. 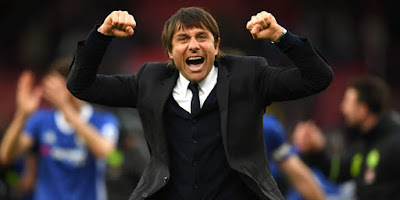 Antonio Conte was right to beam with pride about his team and claim that they are building something important under his management as it has all the signs of the successful teams we have been luckily enough to witness over the last twelve to thirteen years.